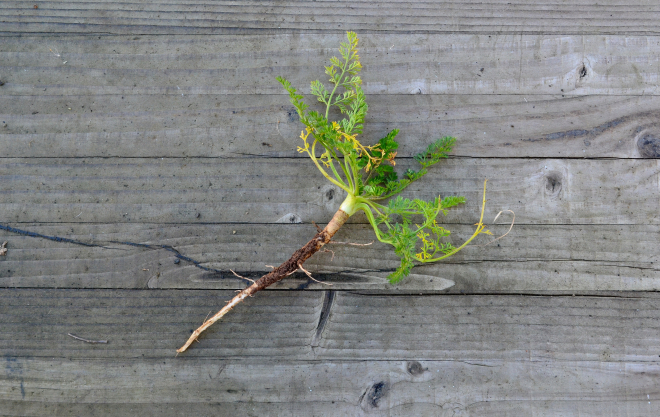 Wild carrot is often confused with poison-hemlock, especially in the spring. This post has excellent photos and information to keep people from making a terrible mistake between an edible plant and a poisonous one. Queen Anne’s Lace is yet another weed often reminding me of childhood. More often than not I would spot an occasional ant crawling around the blossom, which at that time, led me to believe its name to be “Queen Ants Lace”. I reasoned that the single purple flower must represent the Queen and the worker ants walked the flower to pay tribute. You gotta love a child’s logic! Even so, I can remember pulling up the plant and smelling the very distinguishable carroty aroma from its roots. I even confronted my Mother about this discovery. However she made it very clear that I should not eat it, as it was “poisonous”. It wouldn’t be for another 16 years till I reconsidered its edibility.